Create up to nine copies of audio/video recordings in realtime. Copies are recorded direct to USBs with a local copy stored in your video library for future use. One, Two or Four different source recordings can be copying at the same time depending on which Brobox model you are using. Entertainers can be provided a recording to take away post event that is playable on their personal players at home. Rehearsals can be reviewed and critiqued with the embedded timecode (clock, counter or custom start) referenced to allow any directions shared to be easily viewed in the correct context. Copies of the event can be included into packages or sold separately to allow patrons to enjoy the entertainment beyond the initial event date. Monitor your recording(s) through video, audio and animated dials. Track the progress of the recording(s) and available capacity of each USB being recorded to. The home screen provides a dashboard to track local storage use and available capacity. Access is provided to the video and logo libraries to manage the locally stored video and logo files. 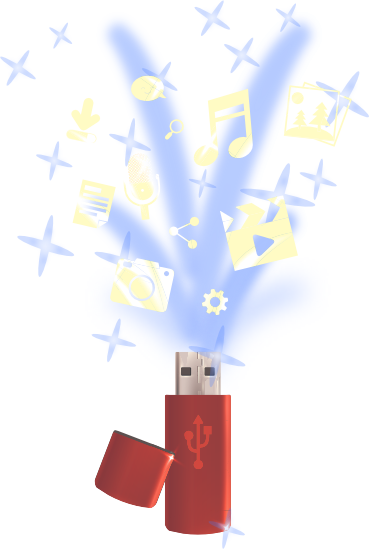 Set up recording profiles and assign recordings to USBs while being able to see the available capacity for each USB. Format USBs as needed for Mac or PC use.